Jamestech has continued our long relationship with Papua New Guinea. Most recently, our Electrical Engineers were requested to assist with the Electrical Engineering at the Morobe Joint Ventures, Hidden Valley Minesite and Wafi Golpu Minesite. Hidden Valley, the open pit, gold/silver mine and processing plant, was commissioned during the 2010 financial year. 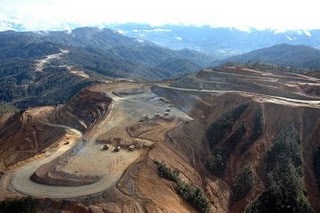 The Wafi copper/gold project is confirmed as one of the highest-grade copper/gold porphyry systems in South East Asia and plans are to bring the underground mine into production in 2016. 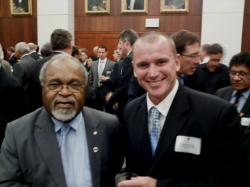 Picture – Sir Michael Somare, PNG Prime Minister and Darren Caulfield, Jamestech CEO at a function earlier in the year.